Blog Three: How I learned PowerPivot Blog Series – Behold, the Data Model! As a quick review: the first post in the series described how I used an iPad and Excel 2013 to capture stats for my son’s youth football team. The second post focused on taking raw data and prepping it to work in PowerPivot, while the third post detailed how I created relationships in the data within PowerPivot. In today’s blog, I’ll use this data model as the source for creating measures and displaying information in a Pivot Table (or two – we’ll see how far we get in this post). 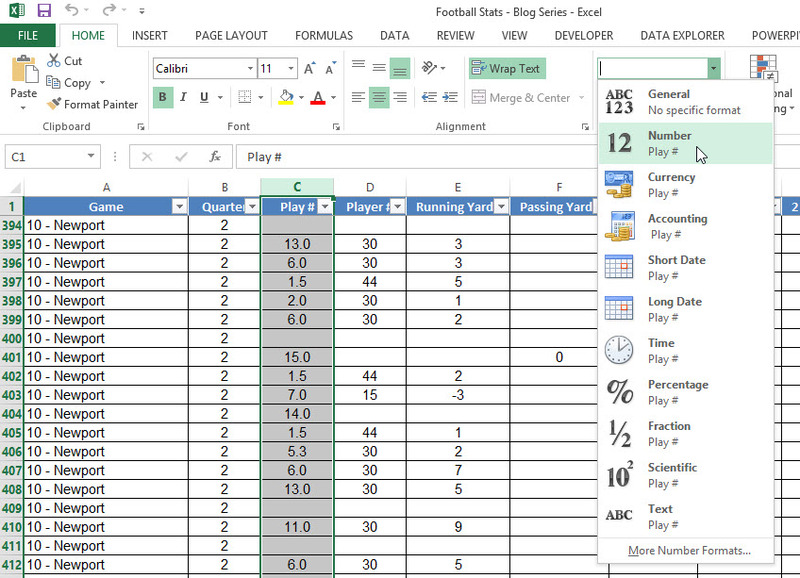 Five tabs in an Excel spreadsheet, each with data related to stats captured during a game, the team roster, the teams played, penalties, and the plays themselves. …which was fine until the coach asked me for similar analysis regarding scoring. Problem is, I only tracked the result of the play (touchdown, extra point, fumble, penalty, etc) but not the numerical score itself. Calculated Columns to the rescue! 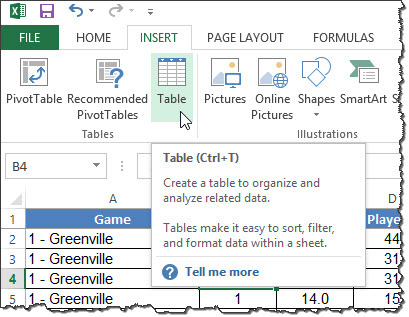 And due the magic within PowerPivot, the formula is automatically applied to every row in the table. I double-clicked the column header and typed in Points_Scored, and I was done. Good stuff so far – the coach is getting good info. He then asks: “can you show me stats by player of all-purpose yards?” In other words, the coach wanted some analysis of the total of offensive rushing, receiving, kick and punt return yards by player (and by offensive I don’t mean it in a bad way, although some of the runs were pretty ‘sick’). Although all-purpose yards weren’t tracked when I took the stats, I used another calculated column to sum the total of the rushing, et al yardage. …which is as easy as it sounds. 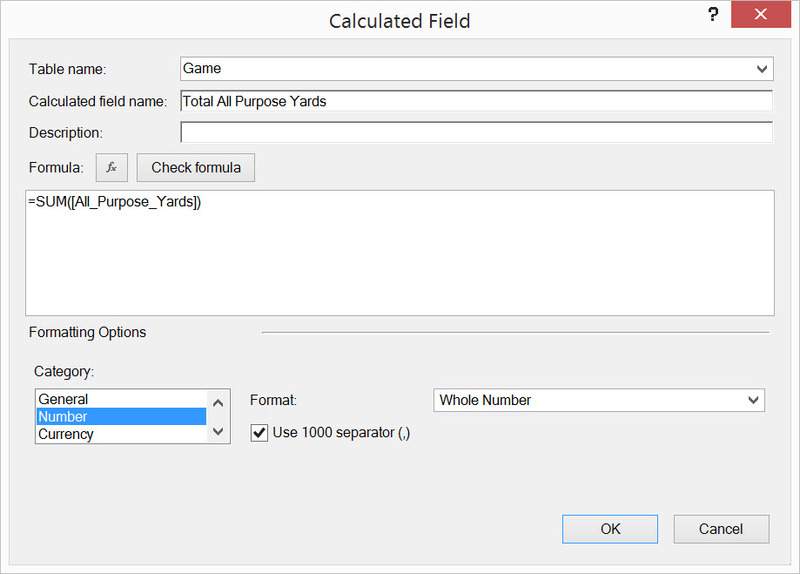 Entering in the formula below in a new column and renaming the column All_Purpose_Yards, and voila – instant measure. 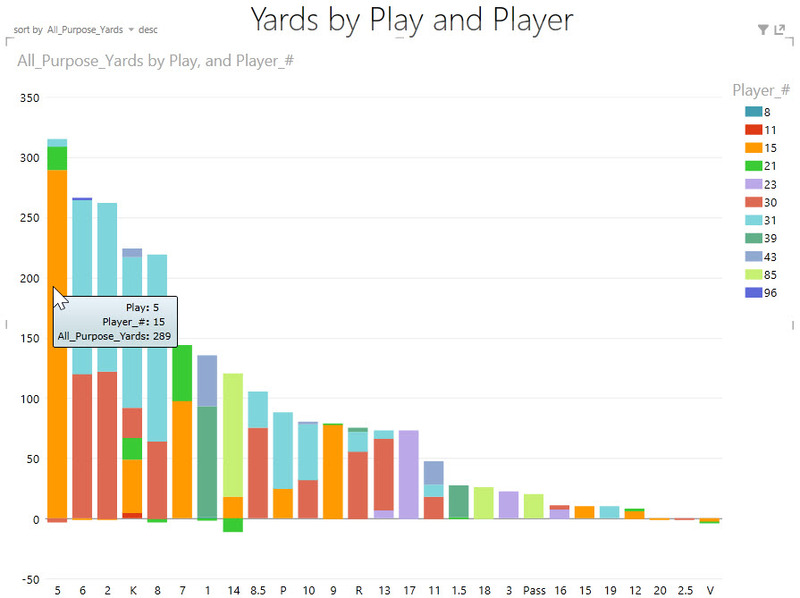 But, wait, knowing the number of all purpose yards run on a single play is kinda interesting. But what the coach really wants to know is the total number of yards by a player. Or in a game. Or when running a particular play. Now what? You’re gonna need a Measure. Essentially, that’s it. Well, at least enough to get started. So, let’s start. Now all that’s left to do is click the AutoSum button, and the Measure is automatically created for you! 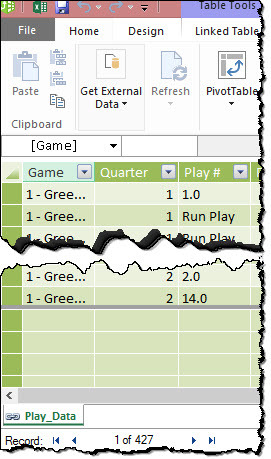 While creating Measures within the PowerPivot window is convenient, especially for these “sum the column” measures, I find that use the Calculated Fields option more often as 1) I have more control over the formatting of the data, and 2) I end up creating a larger number of Measures that are more complex than the basic “sum the column” measures. One thing to pay close attention to is into which Table will the Measure be saved. Since this Measure is associated with the Game, I choose to save it into the Game table. Taking a moment to think about how the Measures will be organized will not only save time in the future, but make it much easier to create pivot tables and Power View visualizations. 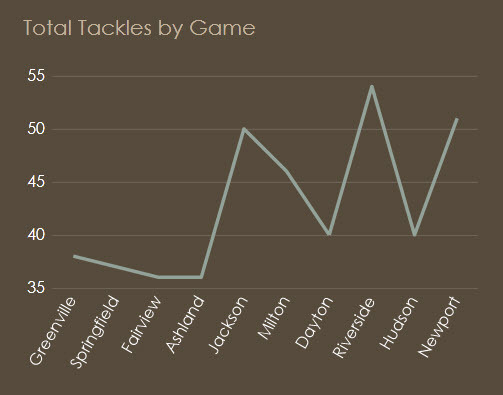 By looking at the above chart in Power View (more on Power View in a later post), I can easily see that player #15 had 289 all purpose yards when the team ran play #5. I can also instantly know that play 20 and 2.5 were complete duds. (If you’re wondering why not mention play ‘V’ – that’s the best play in the playbook: the Victory formation. You’d expect to lose yardage). While this statistic is helpful, it is only one stat – the coach wants ‘stats’. Plural. Meaning more than one. 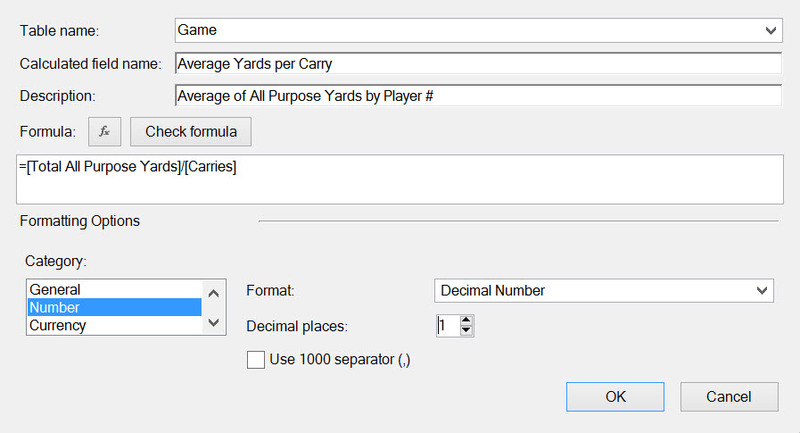 Like, for example, average yards per carry and average yards per game. Easy, right? You just take the total yards gained and divide that by the total number of carries, right? You’d be correct. 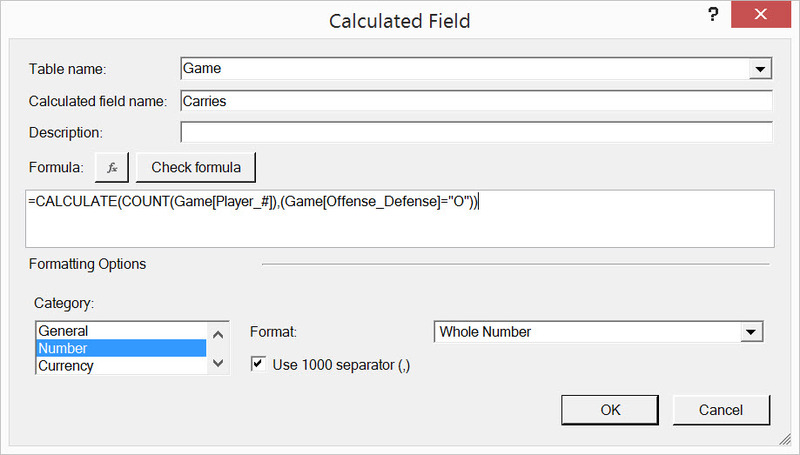 Problem is, we don’t know the total yards for the player or game, we only know the total yards for a specific play in a specific game by a specific player. Hmmm, I wonder how we can solve this problem…? The CALCULATE is a powerful and versatile Data Analysis Expression (DAX) function. If you are not already familiar with using DAX formulas within Power Pivot, I highly recommend Rob Collie’s book DAX Formulas for PowerPivot. Not only did I find it an invaluable resource, I actually enjoyed reading Rob’s book. Entertaining and informative. Now this is what the coach was looking for (adding the background image was a nice touch IMO). With this, he could easily see the players that were producing the team’s offense. But as important, and maybe even more so given that this is a Youth football team, identify those players that not as involved so he could look for ways to increase their contributions. 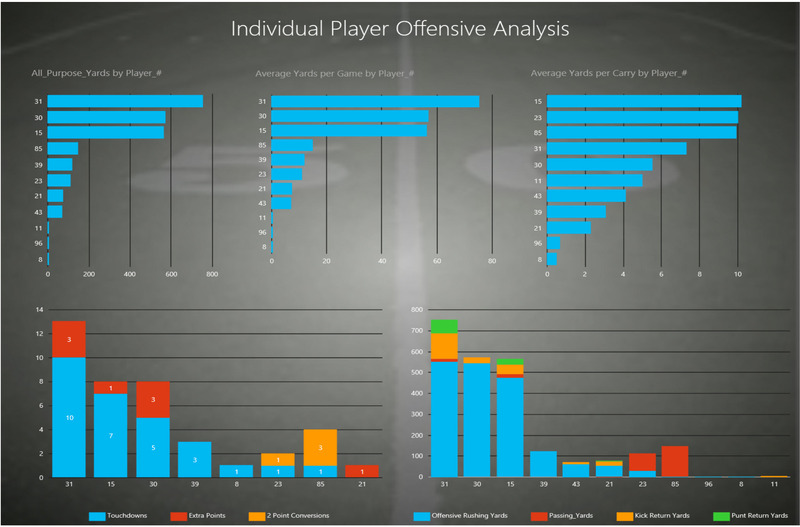 A nifty feature of Power View is the ability to click on a particular player and have the charts automatically highlight that player’s stats across the five charts. Excel is a great tool for doing all sorts of things, and if you’re anything like me you use it all the friggin’ time. Excel with PowerPivot? Well, now we’re talking pure awesomeness. You think I’m being a touch hyperbolic? Nope, I’m not. Being able to create my own dimensional models and then immediately using them for ad-hoc analysis is taking Excel to another dimension (pun totally intended). Yeah, learning DAX might take a bit of time and effort, but making this investment pays huge dividends when you can take even a modest amount of data and transform it into useful analysis. 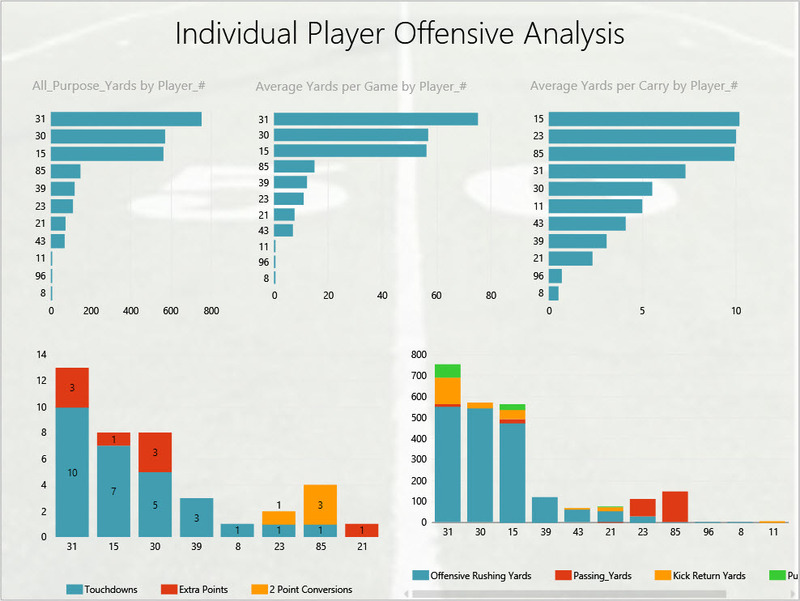 This blog series has focused on a season’s of stats data from a youth football team and using PowerPivot to gain insights on team and individual performance. Hmmm…does this have relevance in the business world? Indeed it does. I co-authored a White Paper called The Changing World of Business Intelligence: Leading with Microsoft Excel that talks about how Excel with Power Pivot can be a place of convergence for technical and business folks to create business-oriented analytical solutions. It’s worth a read – you may gain some useful insights. How I learned PowerPivot Blog Series – Behold, the Data Model! As a quick review: the first post in the series described how I used an iPad and Excel 2013 to capture stats for my son’s youth football team. The second post focused on taking raw data and prepping it to work in PowerPivot. 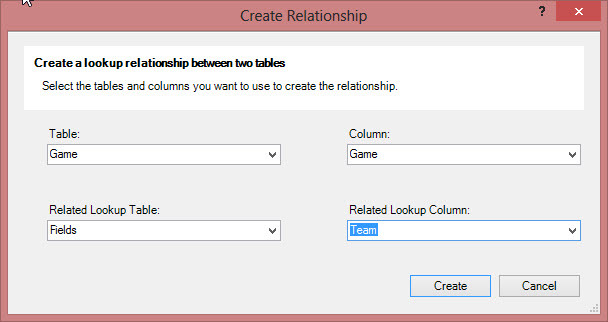 In today’s blog, I’ll describe creating relationships within PowerPivot and create a fully-functioning data model. This data model will serve as the source for creating measures and displaying information within Pivot Tables and Power View visualizations within Excel. Ahh, behold the The Data Model. It’s almost as if the privilege for even speaking these words were once only reserved for Data Analysts (and well deserved, BTW – these are bright people). 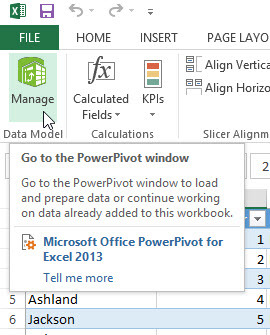 PowerPivot reaches into this rarified air and brings this power to the masses. Well, at least those of us that have basic understanding of the underlying data and knowledge of Excel. In other words, the Power User. As I see I it, Microsoft’s strategy is to position Excel as the de facto BI tool and supercharge it with capabilities such as PowerPivot, Power View, and Data Explorer. Now is a great time to jump in and ride the BI wave! Choosing the Diagram View displays the following data model. Note that the tables are not connected, simply floating as independent entities without any relationships (sounds kinda lonely…). I was fortunate that relationships between the tables were pretty straightforward, in large part because I had planned it that way. In the ‘Think ahead on how your data will be used’ section in my previous post, I had thought about how the data was going to be used by the coaches and how this process informed how the data needed to be structured into Facts and Dimensions. This is the foundational step in creating a dimensional model. For those of you that want to go a bit deeper on a structured approach for dimensional modeling from a business perspective, I encourage you to review TDWI’s Dimensional Data Modeling Primer: From Requirements to Business Analytics document and/or attend a training session. So, let’s get started. I’ll show two common methods to relate tables together: Click-and-Drag and Create Relationships. Assuming we’re still in the Diagram View, I first wanted to create a relationship between the Game table (aka my Fact table) and the Plays table (aka a Dimension table). To do this, I simply clicked on the Play field in the Game table and dragged it to the Play field in the Plays table. That’s all there is to it. You may have noticed that in the Data Model – After screen shot that some of the connections were dotted-line versus a solid line. In PowerPivot, tables may have multiple relationships to each other but only one connection may be active at any time. A solid line connection visually indicate an Active relationship between tables, while dotted-line connections visually indicate Inactive relationships between tables. This is OK – do not fear it. In a subsequent post I’ll talk about how I used the DAX function USERELATIONSHIP in creating a measure that leverages an Inactive connection. Now that I have a viable PowerPivot data model, I’m going to spend the next blog in the series creating a series of basic Measures and a Pivot Table or two. This is where it gets fun, so stay tuned! 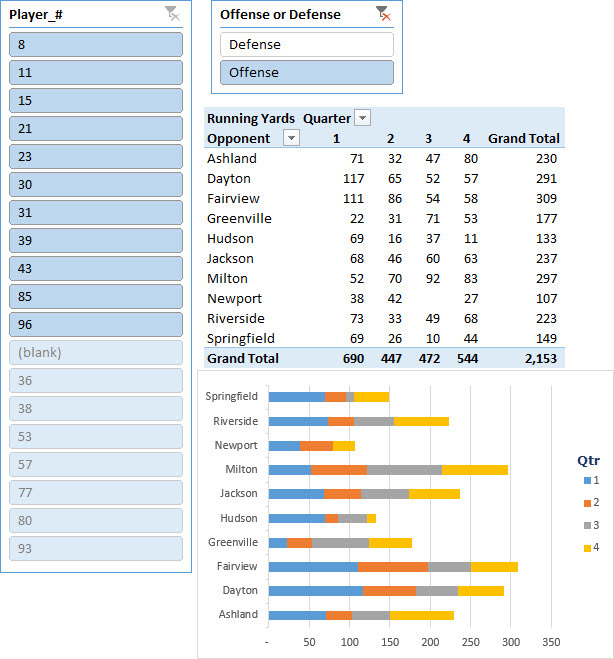 The first post in the series described how I used an iPad and Excel 2013 to capture stats for my son’s youth football team. While somewhat kludgy, it did the job reasonably well. But it was lacking the ability to look deeper into the stats to find nuggets of insight (aka Analytics). So…PowerPivot to the rescue! As noted in the previous blog, I began to recognize that this mass of stats was actually a rich data set that was ripe for deeper analysis. In order to do deep analysis, I needed to ‘pop the hood’ (or ‘bonnet’ for my international audience) and prepare the data to be used in PowerPivot. What is PowerPivot, you ask? I could write an entire blog on this, but Rob Collie already did in his blog entry called What is PowerPivot?. For now, I’ll simply say that PowerPivot is the engine that powers analytics within Excel. Before I go further – it’s important to note that the company I work for (Magenic) provides access to Microsoft Office Professional Plus, which includes Excel 2013. This version allows me to use PowerPivot (and Power View, which will be discussed in a future blog). In other words, if you need these features, make sure you have the proper version of Excel 2013. 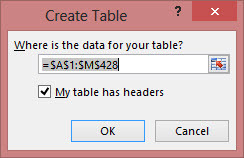 Confirm the data range, and make sure that the “My table has headers” checkbox is checked. Think ahead on how your data will be used. In my case, I knew that the coach wanted to see Rushing Yards by Player, Tackles by Player, Rushing and Passing Yards by Play, Points per Game, etc. There is a pattern: X by Y. In data modeling terms, this is referred to as Fact by Dimension. In my case, the Play_Data table became my Fact table, and the Roster, Plays, and Teams tables became my Dimension tables. I’ve seen my share of SWS (Super Wide Spreadsheets), where every imaginable piece of data is stuffed into a massive number of columns. Not only does it make it difficult to print, this approach makes it difficult to use with PowerPivot. Keep what is being measured in one table, and what it is being measured by in separate tables. Clean data is good data. While Excel accommodates a bit of sloppiness when it comes to data, PowerPivot and tools like Pivot Tables and Power View do not. 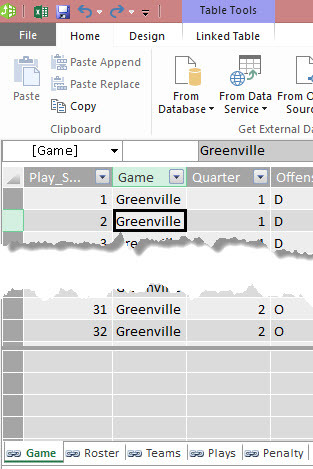 For example, “Offsides” and “Off Sides” may be the same penalty, but not to PowerPivot. “12 yrds” and “12” may convey the same information, but one is a text entry and the other is a number. In my case, I inputted my fair share of phantom player numbers and play numbers as well as a large number of misspelled penalties. Renaming is Key! 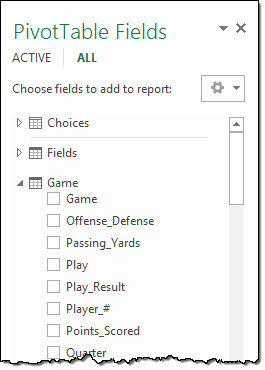 The names that you assign to columns and tables will be used extensively in PowerPivot, and it’s important to know up front that PowerPivot doesn’t “auto-fix” formulas when you later rename a column or table. Save yourself time and headaches in the future by thinking it through (even a little bit helps). I tip my hat to Rob Collie for that tip, which is found in his book DAX Formulas for PowerPivot – The Excel Pro’s Guide to Mastering DAX. A great read for those who want to take their PowerPivot skills to the next level. I selected the Team column and clicked on the Sort by Column button on the ribbon. In the dialog box, I set the Team column to be sorted by the GameNumber column and clicked OK. In the next blog of this series I’ll show you how to create relationships within the Data Model. First, the request: at the beginning of my son’s 6th grade football season, his coach asked me if I could take stats for the team. He was looking for the very basic: rushing yards and tackles. I had done it once the previous season, filling in for a parent that couldn’t be at the game. Simple stuff, really. Since having this information helps the coaches better plan for the next game, I said yes to the request. Being the tech savvy over-achieving business analyst that I am, I thought about the easiest way to capture the data. Writing it down? Not a chance. I avoid picking up a pen or pencil whenever possible. Our family has an iPad, so why not use that? I did a bit of research, and settled on using Numbers to capture the data during the game, export the data, email it to myself, and import it into an Excel spreadsheet. But to use all this capability to just capture rushing yards and tackles? Kinda like driving a semi to pick up groceries. It should have been no surprise to those who know me when I added more stats to the spreadsheet – I mean, why not? 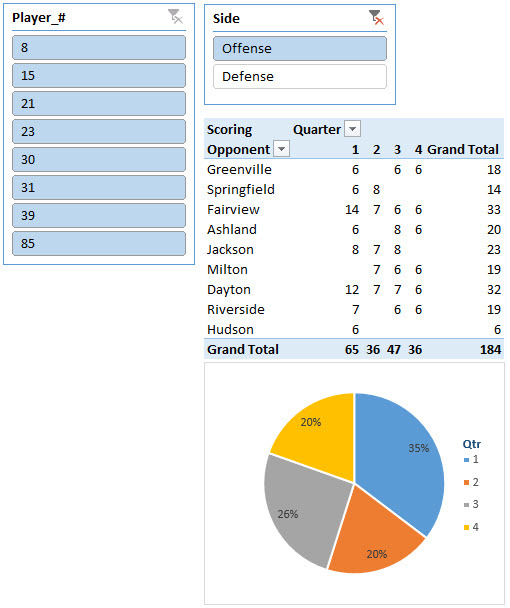 Soon, I had added the play being run, passing yards, kickoff and punt yardage, penalties, touchdowns, etc. Soon enough, I began amassing a fair amount of data. Using the iPad was fairly easy to capture the stats in real-time (thanks to parent helpers that were my spotters), and I had the added benefit of being an unofficial part of the team staff on the sideline. The evolution was already underway, as my Excel formulas were becoming more complex in summarizing stats by play and player. In other words, a bunch of SUMIFS and COUNTIFS-based formulas that did the job, but were cumbersome and cludgy (not to mention error prone). That said, the coaches couldn’t get enough of it and were actually using the data to tweak the game plan on a weekly basis. 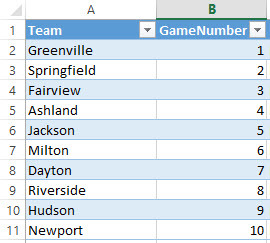 Somewhere during mid-season I discovered is that the football stats were a rich data set that was readily consumable by Power Pivot, a feature available to me in Excel 2010 sitting on my desktop. The evolution of displaying stats takes an interesting turn, which I’ll talk about in the next blog. In a word: Slicers!